If ABCD is a parallelogram and P, Q (positioned as shown in the applet) are such that triangles PAB and BCQ are similar (with P corresponding to B, A to C, and B to Q), then each is similar to triangle PDQ. Note that the statement is a double generalization of a problem by V. Thébault. For one, the square is replaced by a parallelogram. 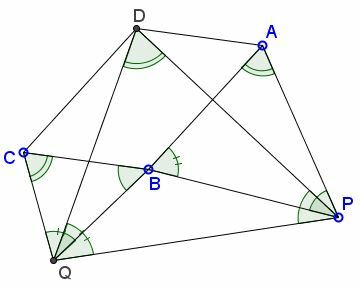 Also, two equilateral triangles are replaced by a pair of arbitrarily shaped similar triangles. PA / AD = DC / CQ. ∠DAP = ∠DCQ = α + β. Let K be the intersection of the diagonals in the parallelogram and L and M the midpoints of BP and BQ respectively. Then triangle KLM is similar to triangles APB and CBQ by the Three Similar Triangles Theorem. Triangles KLM and DPQ are similar as having pairwise parallel sides. William McWorter has noticed that the linear combinations in Proof 2 can be replaced with common vector (or affine) sums. Taking B as the origin, we have D = A + C, P = P + B, and Q = B + Q, which makes ΔDPQ similar to ΔAPB and ΔCBQ directly, without the intermediate ΔKLM.